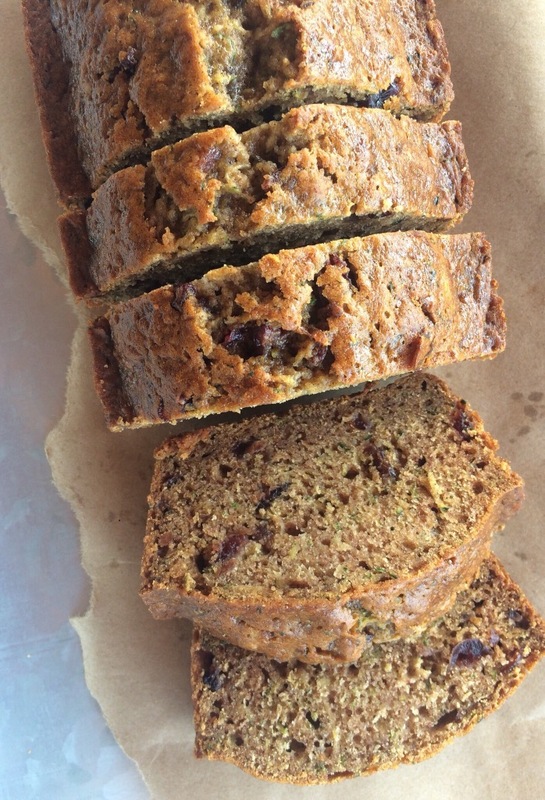 Another zucchini bread recipe to help you use all your fresh zucchini…. You have no need to look for another zucchini bread recipe, here is the best one out there. I’m absolutely in love with this bread. It’s super moist and I love the subtle hint of cinnamon. Plus, you don’t have to pull out a mixer, just mix it up by hand. This recipe makes two loaves, you can make a loaf for yourself and a loaf for a friend. I chose to give a loaf to my friend Ana Maria, she raved over this bread. We both enjoyed it for breakfast with coffee. It took us only two mornings to finish off this bread…. yeah it’s that good. We both agreed that the cranberries and pecans were our favorite part, they added flavor and texture. Make this bread as some as possible! Please share it with a friend, they will love you for it. 1)The pecans and dried cranberries are optional, but I really think it takes the bread to the next level. 2)I like to make half of this batter in a loaf and the other half into muffins. Preheat oven to 350 degrees F. Spray two loaf pans with non-stick cooking spray. Drain grated zucchini in a strainer over a bowl to remove excess moisture. Whisk together flour, baking soda, cinnamon, salt, and sugar in a large mixing bowl. Create a well in the dry ingredients, add in eggs, vanilla, and melted butter, mix together. Mix in grated zucchini, chopped pecans, and chopped dried cranberries. Pour batter into prepared loaf pans and bake in preheated oven for about 50 minutes or until toothpick inserted into the center comes out clean. Cool in pans for 10 minutes before turning out on a wire cooling rack. Enjoy !